BY USING THIS WEB SITE, YOU ARE INDICATING THAT YOU HAVE READ, ACKNOWLEDGE, AND AGREE TO BE BOUND BY THE POLICIES, TERMS AND CONDITIONS SET FORTH BELOW IN THEIR ENTIRETY WITHOUT LIMITATION OR QUALIFICATION, AS WELL AS ALL APPLICABLE LAWS AND REGULATIONS, AS IF YOU HAD HANDWRITTEN YOUR NAME ON A CONTRACT. IF YOU ORDER ANY TICKETS OR OTHER MERCHANDISE OR SERVICES THROUGH THIS WEB SITE, YOU AGREE THAT ALL OF THE FOLLOWING TERMS ARE INCLUDED IN ANY CONTRACT FOR SALE BETWEEN YOU AND A GREAT PLACE TO SIT. The terms, "We," "Us", "A Great Place to Sit", or "AGPTS," refer to A Great Place to Sit, Inc., a Florida corporation with its principal place of business at 1800 SE 10th Ave Suite 202, Fort Lauderdale, FL 33316, in the United States of America. The term "You" includes any person using this Web Site, any person who allows another person to use the first person's credit or debit card account in connection with this Web Site, and any person who uses tickets, merchandise or services obtained from this Web Site. We are a TICKET BROKER! WE SELL TICKETS FOR MORE THAN FACE PRICE. We are not connected with any team, venue, box office, artist, act, performer or musical group. We are not Ticketmaster®. Tickets are a one-of-a-kind item and are not replaceable. There are no refunds, exchanges or cancellations of any order once it is submitted to us. All prices are guaranteed at the time the order is CONFIRMED by A Great Place to Sit, Inc. Online orders placed after 4PM Eastern Time weekdays or on weekends or holidays may not be processed until the next working day. Due to circumstances beyond our control, in certain rare cases, confirmed tickets may not be available. If this circumstance arises we will notify you within two business days. When you receive your tickets keep them in a safe place. Tickets cannot be replaced if they are lost, stolen or damaged. Please note direct sunlight or heat can damage some tickets. If an event is canceled for any reason other than an act of God (rained out, hurricane, flood, etc. ), strike, or lockout we will provide a full refund for the amount that you paid for the tickets. Any shipping charges are not refundable. If an event is postponed the tickets will be honored for the new date of the show. New tickets will not need to be issued. In case of a rainout or strike for a major sporting event, you must exchange the tickets at the venue for a seat to a future game that is still available. Shipping charges are calculated based on your location and the shipping method. If we ship via a third-party carrier (e.g. FedEX®, UPS®, etc. ), risk of loss transfers to you when we place the package with the third-party carrier. It is your responsibility to have an adult at the delivery address to sign for the package. We are not responsible for tickets, which are not received because no adult was available at the delivery address to sign for the package. You agree that the third-party shipper's business records shall be conclusive as to attempted delivery. Tickets are bought and sold on an open market; prices are subject to change at any time. Orders with ticket groups of two (2) or four (4) are guaranteed to be together. All other quantities are not guaranteed to be adjacent. We will attempt to group seats according to the requested quantity. You can pick-up your tickets at our main office. We are located at 1800 SE 10th Ave Suite 202, Fort Lauderdale, FL, 33316. USE OF THE WEBSITE, THE SERVICES, TICKETS, AND ANY OTHER MERCHANDISE ARE AT YOUR EXCLUSIVE RISK, AND THE RISK OF INJURY FROM THE FORGOING RESTS EXCLUSIVELY WITH YOU. EXCEPT AS EXPRESSLY PROVIDED IN THE TERMS OF SERVICE ALL TICKETS AND SERVICES ARE PROVIDED "AS IS" AND WITHOUT WARRANTIES EITHER EXPRESS OR IMPLIED INCLUDING BUT NOT LIMITED TO ANY WARRANTIES OF MERCHANTABILITY OR FITNESS FOR A PARTICULAR PURPOSE. UNDER NO CIRCUMSTANCES WILL WE BE LIABLE FOR CONSEQUENTIAL DAMAGES OR LOST PROFITS. A GREAT PLACE TO SIT, INC. DOES NOT WARRANT THAT (1) THE WEBSITE OR SERVICES WILL BE UNINTERRUPTED OR ERROR FREE; (2) DEFECTS OR ERRORS IN THE WEBSITE WILL BE CORRECTED; (3) THE WEBSITE WILL BE FREE FROM VIRUSES, WORMS, TROJANS OR OTHER HARMFUL COMPONENTS; (4) ANY INFORMATION CONTAINED IN THE WEBSITE WILL BE ACCURATE OR RELIABLE. A GREAT PLACE TO SIT HAS NO CONTROL OVER CONDITIONS AT THE VENUES WHERE EVENTS ARE HELD. EVERYONE MUST AT ALL TIMES BE AWARE OF CROWD AND LIFE-SAFETY ISSUES. YOU AGREE TO INDEMNIFY AND HOLD HARMLESS A GREAT PLACE TO SIT, ITS OFFICERS, STOCKHOLDERS, EMPLOYEES, AND AGENTS, FROM ANY CLAIM OR CAUSE OF ACTION BY YOU, YOUR HEIRS OR ESTATE, OR BY ANY PERSON TO WHOM YOU GIVE, SELL, OR OTHERWISE TRANSFER ANY TICKETS, MERCHANDISE, OR SERVICES, OBTAINED FROM THIS WEB SITE, FOR BODILY INJURY OR DEATH RESULTING FROM THE USE OF ANY TICKETS, MERCHANDISE, OR SERVICES OBTAINED FROM THIS WEB SITE. This Agreement will be governed by the laws of the State of Florida applicable to contracts entered into and performed exclusively in that State. Any court of competent jurisdiction sitting within Broward County, Florida, will be the exclusive jurisdiction and venue for any disputes arising out of or relating to this Agreement. You hereby waive any argument that any such court does not have jurisdiction over any dispute or that the venue in any such court is not appropriate on convenient. A Great Place to Sit, Inc. will be entitled to its court costs and reasonable attorney fees and expenses incurred in any litigation brought to enforce any term of this Agreement. In the event that any check, credit card or other form of payment you tender to A Great Place to Sit, is declined or refused or if you fail to pay for any tickets or services, A Great Place to Sit shall be entitled to its costs of collection including court costs and reasonable attorney fees and expenses. This Agreement constitutes the entire agreement between the parties and supersedes all prior agreements or communications with respect to the subject matter herein. A Great Place to Sit, in its sole discretion, may change the terms of this Agreement at any time and your use of the Website after such changes are posted will mean that you accept all such changes. If any term of this Agreement is declared unlawful or unenforceable by any court, then such term will be deemed severable from the rest and will not affect the validity and enforceability of such remaining terms. You are 18 years of age at time of purchase in order to use this website. By using this Website, you agree to the terms of this Agreement. If you do not agree to the terms of this Agreement, you must not use the Website. 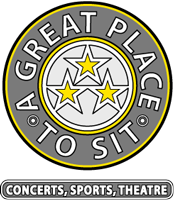 A Great Place to Sit, Inc.